We're now definitely on the cusp between spring and summer as my favourite month of the year is fading out on a warm and sunny note. The Solomon's Seal, aquilegias, brunnera, thalictrums, umbifellers and pulmonarias are giving way slowly but surely to astrantias, geraniums, penstemons, elderflowers and roses. The annual garden club plant sale is done and dusted for another year. The above photo shows some of the plants that I took for sale. There were very few plants in flower on the day, as several of the plants that I had lifted and divided with the plant sale in mind had rather inconsiderately already flowered. I was pleased that foliage plants attracted customers but unfortunately all the tomato plants came back home with me. They walked off the table last year and I could have sold more than I took with me. Sometimes there's no logical rhyme or reason as to what sells and what comes back home. I'm not convinced that I've achieved much of any substance in the garden having spent most of my time weather permitting either in the greenhouse or at the allotment. The annual greenhouse shuffle is playing out its course and the contents are slowly spilling out into the garden or making their way to the allotment. Today with next spring in mind I've sown some sweet rocket, wallflowers and and lunaria 'Chedglow' which I fell for at the London RHS Show in February 2013. Avon Bulbs are now selling seeds of this stunning purple leaved lunaria. I took my camera to the allotment this morning but fell at the first hurdle - I left the camera card out so a verbal description instead.The potatoes which were planted on Easter Monday are now reasonably sturdy plants and fingers crossed the danger of frost is behind us. Broad bean 'Witkiem' and pea 'Douce Provenance' are already forming their first pods. I've planted wigwams of 'Cobra' and 'Blauhilde' French climbing beans, whilst a purple podded mange tout peas (from my own saved seed) and 'Lingua de Fuoco 2' borlotti beans, will be making their way to the allotment in the next few days to be planted. Courgettes 'Romanesco' and the yellow fruiting 'Floridor' are already in the ground. My third courgette 'Brice' did not germinate well so I made latter sowings of 'De Nice A Fruit Ronde'. The autumn planted garlic has grown well but has developed rust whilst the shallots and 'Red Baron' onions are plumping up nicely. Beetroot and chard grown in cells at home will also soon be in transit along with a pumpkin. In the fruit department the strawberry plants have been strawed and hopefully we will be eating them before long. The plants are now in their second year so should produce well. 'Cambridge Favourite' is most floriferous but the newer on the scene plant 'Albion' is definitely not as generous with its fruit so I doubt if it will be a keeper. The gooseberries should also be ready for picking soon and look bar any natural disaster as if they will fruit well. I picked a couple today to sample but they are still too hard. Disaster with the white currants which looked as if they were going to produce in abundance - the fruits have been more or less stripped off the bush overnight! No sign of any creatures so I can only wonder. Although I prefer the red currants and black currants the white currant has been the best performing of the currant bushes so I am rather miffed. The apples are now swelling. Despite 'Katy' being described being smothered in blossom by my plot neighbours she is not fruiting well. 'James Grieve' and 'Sunset' are doing much better. Flowering at the allotment now are chives, sage, rosa rubignosa (sweet brier), comfrey and some self seeded cerinthe. Hopefully soon the wigwam of sweet peas will be joining in and there will be bunches to pick to bring home with me. Plant purchases this month have included a nameless sultry bearded iris, a nameless lime green hosta and a couple of nameless hardy geraniums. I have a feeling that one of them is geranium sylvaticum album although the label said it was something else. Finally a plant with a name - alchemilla erythropoda which I believe to be a better behaved relative of alchemilla mollis. P.S. I forgot to include the three little rhodochiton atrosanguineum plants I bought on Thursday having already sown a packet with the result of not a single seedling. I've sown these several times before so was rather disappointed. All being well I shall be able to save my own seeds this year. Have always been amazed by the price the seed companies charge for this plant. So that was May in my garden and allotment. I'm looking forward to catching up with what has been happening on your patches of earth over at The Patient Gardener's Weblog. With thanks as always to Helen for hosting this excellent meme. With almost indecent haste the spring bulb catalogues are coming through the letter box and once more the annual saga of tulip selection will be upon us. My brow will furrow, I will agonise and waver but no doubt will fall for them again. Tulips - what's not to like? 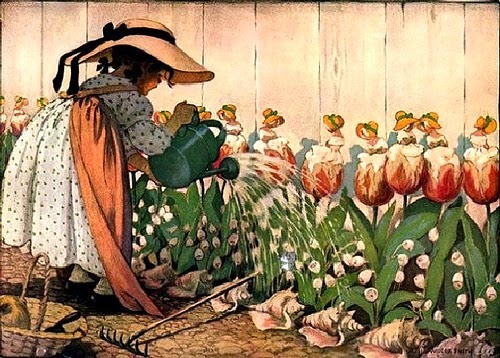 My blogging friends sing their praises, garden writers rave about them and in the past tulip fanciers paid a king's ransom for them. I've never heard or seen anybody say a bad word about tulips. I must be in a minority though when I say that I remain to be convinced. I think that it's the foliage that I find most unattractive followed by other undesirable traits. However my lack of success in growing them consistently well is probably down to my shortcomings as a gardener. Perhaps you can tell me where I am going wrong. This spring's offerings were all confined to containers on the premise that I can get them out of the way quickly once they've flowered. The first big pot was planted in December 2012 with 'Doll's Minuet', 'Ballerina and 'Black Hero'. I must admit did look reasonably attractive the previous spring although the leaves were an eyesore. The first two varieties of bulb flowered again but this time sadly absolutely no sign of 'Black Hero'. This made the remaining tulips stick out like a sore thumb as the latter toned down the combination. They were grew quite tall and took on a marked contorted lurch as they took the brunt of rain and wind. The ugly monster leaves completely flopped and caught my eye from the kitchen window every time I stood at the kitchen sink. Yuk! A good excuse to leave cooking and dish washing to himself for a couple of weeks. Pot numbers two were single plantings - no fancy colour combinations here but 'Spring Green' in a couple of pots and 'Mount Tacoma' in another. Needless to say they did not flourish. The foliage was of one pot of 'Spring Green' was ravaged before it even flowered. I'm not sure who the culprit was although my suspect is a squirrel. I have to cover nearly all my pots of bulbs with chicken wire for the tulips to stand any chance of seeing spring but maybe a determined creature managed to have more than a nibble or two. The other pot simply did not flower well or last any length of time although I suppose that the weather was on the warm side. As for 'Mount Tacoma' planted in two tall ceramic pots there was a conspicuous absence of flower - maybe a couple of flowers from each pot. The remainder were blind. Maybe I did not plant them deep enough? I just don't know. Funnily enough the very first time I planted these bulbs they were stars which is why I was attracted to them again. Finally the last trio, another of Sara Raven's tulip combination suggestions, consisted of 'Havran', 'Prinses Irene' and 'Couleur Cardinal'. They were planted in an old galvanised metal container and were far the best of my tulip plantings this spring but not without fault. Now the leaves had a good habit, the colour combination was absolutely spot on but 'Havran' was much taller than the other two which really irritated me. It was also noticeably first into flower and the last to drop its petals having flowered for a good month. So that is my tulip summary for the spring 2014. Needless to say no photographs were taken hence the above illustration by Jessie Wilcox Smith. I've not had a good browse through the new catalogues yet but I'm sure I will be tempted by tulips again. Initial thoughts though include planting the metal container solely with 'Havran' and investigating species tulips in depth. In the meantime though the names 'Bruine Wimpel', 'Belle Epoque' and 'Merlot' are whispering in my ear. What about you? Any foolproof recommendations? Any thoughts on what tulips you will be planting this autumn and does anybody else find them a challenge or is it just me? "It would be difficult at this time of year not to see beauty in weeds. The ditches in our lane are milky with the white nettle, that exquisite flower with the form of an unsophisticated orchid. In the orchard the sequence of flowering weeds runs it course. As dandelion fades, it gives place to brown plantain with its lace ruff, speedwell, purple vetch, buttercup and cow parsley. Spikes of the beautiful wild salsify stand among the growing grasses, closing their flowers at midday : goat's beard, as some call it, or John-go-to-bed-at-noon, as it is known to others. Along the hedge-bottoms gleam the cuckoo-pints, challenging the darkness of the hedge shade with pale green staves, flapping their limp petals over themselves as their time of flowering draws to its close. Was any flower the possesor of so many names? Cuckoo-pint, priest's pintle, lords and ladies, wild arum, good King Henry *. There is as much charm in the names of our wildflowers and weeds as there is in the flowers themselves"
*Richard Mabey's book 'Flora Britannica' quotes yet more names for the cuckoo-pint including Jack in the pulpit, Devils and angels and Cows and bulls. A most cooling woodland walk where there were blazes of colour from rhodendrons, azaleas and camellias. A fine specimen of a Davida involucrata waved its handkerchiefs at us as we walked past. Great views over the Cheshire countryside. Farm animals and an aviary for the young and the young at heart. A walled kitchen garden which I would like to see later in the year. It includes a well stocked small nursery. I was restrained and left with just a lemon mint as we had some way to walk back to the car. All in all a most enjoyable interlude and well worth a visit if you find yourself in the vicinity. I had intended to write a longer post. However my thought processes have been interrupted firstly by a thunderstorm and then the trauma of a dropped mouse which took some putting back together hence the brevity. This blogger needs to recover her equilibrium! The above hardy fuchsia was introduced to the garden many moons ago. It was the product of a cutting that I took from its parent when I was out on a short walk close to home. The shrub that I nipped a few impromptu cuttings from was on the public highway, so I had no qualms about taking some little pieces from it along with some from its red flowering neighbour. The red flowered one did not take but I was successful with the pink. The resulting shrub is now way too big for its present position and comes in from much verbal abuse from himself, as it dares to stretch on to the pathway and brush against himself. It's in for a severe chop or perhaps even a complete extraction. Earlier this spring I rooted a sucker which has now made good growth so we have a duplicate which will go elsewhere in the garden. The fuchsia normally drops all its leaves overwinter but not so this year when the majority of them clung on. It does not usually flower until well into the summer and can be relied on for some late colour most years into October. This spring it started to bud in April and here we are before the middle of May when it is positively dipping with flowers. It's never looked as healthy. I've come to the conclusion that it must be the combination of the mild winter and all that wet stuff we had earlier in the year. Those conditions must have suited it down to the ground. The only negative niggle is I wonder what will happen by the time it usually flowers. Will it have all fizzled out by then or will it get a second wind. Are there any plants behaving oddly in your garden this spring? 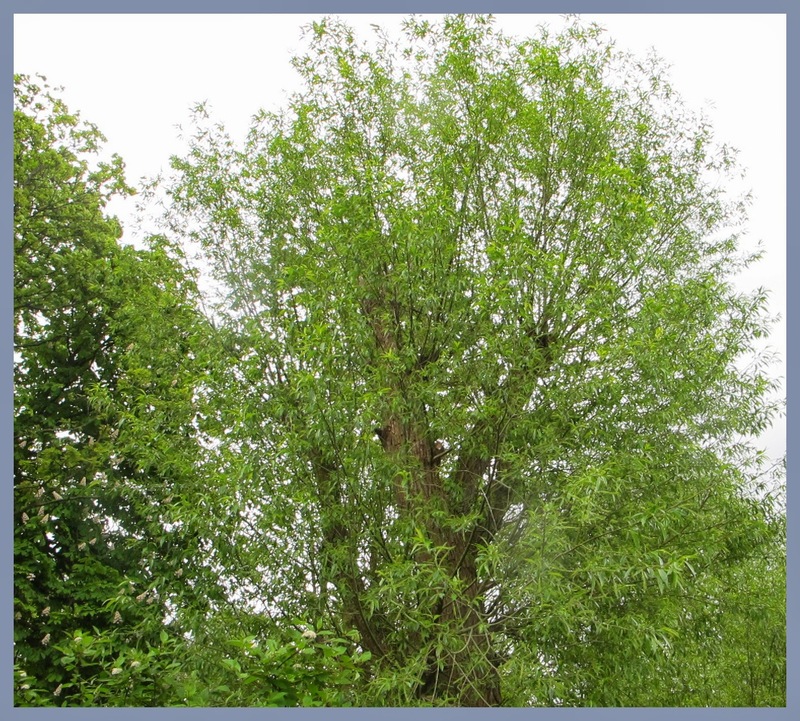 What a transformation from the first tentative leaves opening in early April to the full on state of greenness that is my willow today. 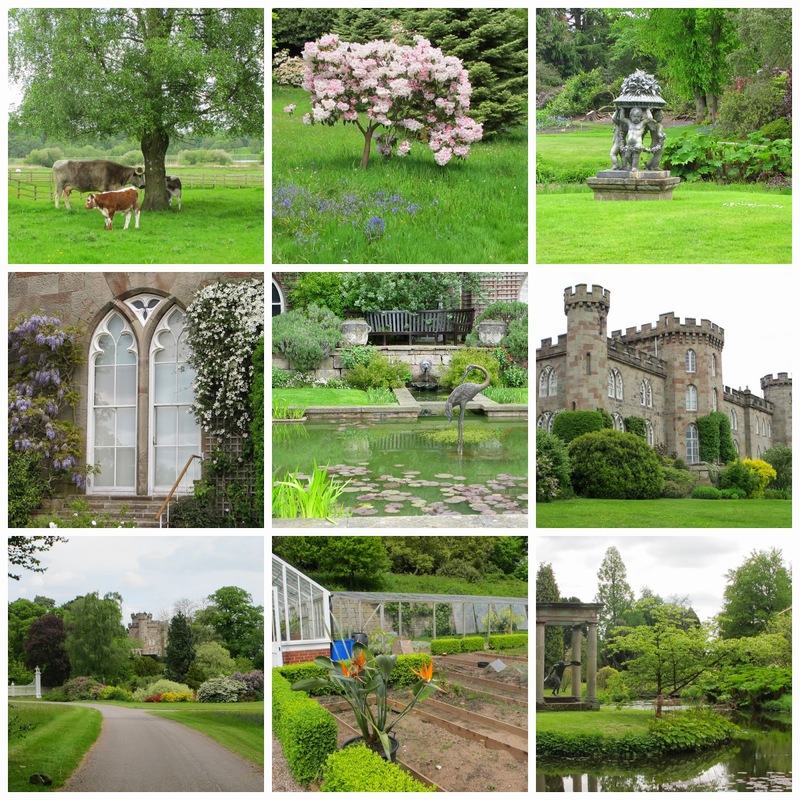 Today's forecast is for intermittent rain, so photos were taken yesterday just in case. I've decided that the best view of the willow is impeded by the rotary washing line. It was in full flow drying mode yesterday so I will try to remember to temporarily remove it next month. I've nipped out into the garden though today and peered over the stream (the tree is just outside our garden boundary close to a stream) to observe the vegetation. Nettles, cleavers, herb robert and cow parsley definitely have the upper hand. Nearby neighbouring trees a horse chestnut and a hawthorne are both wearing white. I hope that the willow is not envious of their finery. As well as leaves the willow is now sporting innocent looking catkins as you can see in the photo above. The word' innocent' has been chosen deliberately. An explanation will in due course. Watch this space! Writing about my willow has reminded me about a book I bought some time ago. 'Why Willows Weep : Contemporary Tales From The Woods' is a collection of some nineteen short stories by modern authors. The star of each story is a different variety of tree each with their own tale to tell or to be told of. I've written more about this book here and here. I'm sure that it would be enjoyed by any tree lover and sales of the book enable The Woodland Trust to plant more trees. A special thanks to Lucy over at Loose And Leafy who came up with the idea of a tree following meme. You can read all about what a host of other trees are up to this month here. A slightly delayed EOMV post mainly because I was away from home and garden for a couple of days or so at the end of the month, during which time everything seemed to have grown with indecent haste. This time a phrase for the month rather than a single word - the phrase being 'ENGAGE BRAIN BEFORE ENTERING THE GREENHOUSE'. The latter was scheduled for a thorough winter top and tailing but the saga of the nose put pay to this, so it became more of a quick lick and polish when I was feeling up to it. At this point I removed last year's detritus with gay abandon and at one stage knocked a poppy seedhead into the compost bin. I fished it out immediately but too late the damage was done. The consequence was that some early sowings sprouted zillions of unwanted seedlings which I've spent ages extracting. Grrrrrrrrrrrrr! Why I took the seeds into the greenhouse into the first place is beyond memory but the greenhouse will be strictly out of bounds when I'm saving seeds later this year. It was a busy month mainly with sowing, the inevitable pricking out and starting to harden stuff out. I sowed a second batch of tomatoes which were more successful than the first I'm pleased to say. The first have been pricked out whilst the second await that pleasure. 'Box Car Willy', 'Banana Leggs', Ananas Noire', 'Cream Sausage' have been joined by 'Gardener's Delight,' 'Sungold', 'Noire De Crimée, 'Black Cherry' and 'Aunt Ruby's German Green Cherry'. Cucumber 'La Diva' has germinated along with courgettes 'Romanesco and 'Floridor'. Germination of courgette Brice' has been disappointing so another batch will be sown this weekend, or maybe I will try another round green courgette. Pumpkin 'Black Futsu' and 'We B Little' were also sown. By the end of the month the greenhouse also contained beetroot and chard seedlings, basil - 'Mrs Burn's Lemon', 'Purple Leaf' and 'Lettuce Leaf', sunflowers 'Red Velvet', 'Vanilla Ice', more sweet peas, gaura lindheimeri and cosmos bipinnatus 'Purity'. I think that I may have already mentioned that for various reasons I'm sowing less this year. It's been difficult to restrain myself but I'm just about winning at the moment. Elsewhere a few overwintering plants lurked. One or two of the dahlias started to sprout even before they had their first drink of the year, a couple of lemon verbena teased me with their dried up twiggy state (will they ever green?) and the pensetmon cuttings shuttled in and out of the greenhouse. At the allotment shallots and red onions were planted along with broad beans and peas. Unfortunately the last two crops are already showing signs of serious nibbling. I will be putting more peas in later but just hope that the broad beans recover as I will not be sowing more. Much time has been spent weeding and tidying but much more hard graft remains. My early potatoes went in on Easter Saturday. Early days yet but it looks as if it is going to be a good year for goosegogs, white currants and strawberries. I've been enjoyed some delicious purple sprouting broccoli so must remember to sow it again. In the garden the plants that gave me greatest pleasure in April were daffodils - all variations on a whiter shade of pale including 'Thalia', 'Elka', 'Topolino', 'Jenny', 'WP Milner', 'Minnow' and 'Pueblo', pulmonarias and brunneras. The pear blossom was a treat but it still remains to be seen whether fruit will flower this year. The candidate for the most miserable specimens of the month were without a doubt tulips but perhaps that's a subject for another post. There were several April plant purchases some via mail order, some from a garden centre trip and others from a plant fair but rather than 'fess up all at once I will introduce them in coming posts. The one reveal is auricula 'Late Romantic'. I feel that this may be the start of a slippery slope to another fatal addiction. Unexpected pleasant surprise of the month was to be the lucky recipient of a copy of Louise Curley's (aka Wellywoman) book 'The Cut Flower Patch'. This came about through entering a giveaway organised by the lovely Caro over at 'An Urban Veg Patch'. You can't imagine how delighted I was be so fortunate especially in view of my self imposed embargo on new book purchases this year. My resolve had been in serious danger of cracking! I'm looking forward to a good browse through this book soon. Thanks again Caro and thanks also as usual to Helen over at 'The Patient Gardener's Weblog' who came up with the idea of an end of month view. I'm off later to catch up with what everyone else got up to in April.